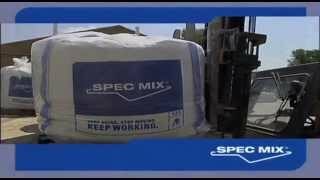 All Season Silo Mixing Station Made Easy! The SPEC MIX® All Season Silo Enclosure System is a durable system developed to protect contractors working in cold, rainy, windy or sunny weather conditions. Custom designed to form fit the SPEC MIX G7000 silo system, this versatile silo enclosure consists of individual component pieces and panels to function as a total enclosure system for cold and rainy conditions or a partial system for wind and sun protection. This portable and reusable weather barrier can be set up by one person in 20-minutes or less—all that is required is a step ladder. Made from durable marine-grade material, sturdy straps and metal clamps, the All Season Enclosure provides an excellent, economical solution to all-weather construction needs.